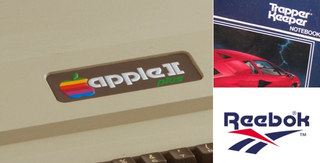 Apple, Trapper Keeper, and Reebok: Three of the most well-known brands of the 1980s, and three companies that used the same futuristic-looking typeface to do it. So why isn't the typeface a classic like other period pieces *cough*Helvetica*cough*? Fate is a funny thing. Today Fonts In Use and BrandNew point out the odd case of Motter Tektura, a typeface created in 1975 by the Austrian designer Othmar Motter, who died in 2010. If you were alive in the late 1970s or 80s, you'll recognize it as the former font used in Apple's early logos, as well as those of Trapper Keeper and Reebok—which kept it in use well into contemporary times. While Motter, and his Tektura, might be household names within the typography world, they certainly aren't well-known to the general public. Yet like famous typefaces like Helvetica and Arial, Tektura played a major role in early consumer technology (and puffy file folders!). So what happened? Well, it's hard to say, but there are a few explanations. Fonts In Use points out that there's no authorized digital version of Tektura, which would make sense—in 1975, or even 1979, some typefaces were still drawn as analog letterforms. Tektura arrived at the tail end of that era, and seemingly never made the leap. What's more, Font Feed points out that Motter moved away from type design after those successful years, focusing on logos instead. Update: The bite mark wasn't changed as much as originally reported, and this post has been edited to reflect that.